Some of the alternative worker groups that led the charge against former labor secretary nominee Andrew Puzder may get some scrutiny of their own no matter who runs the Labor Department under President Donald Trump. The Trump administration is expected to take a closer look at worker centers, an amorphous category of advocacy group that broadly includes Fight for $15 and other traditional labor union affiliates, along with independent grass-roots organizations such as Restaurant Opportunities Center United. The scrutiny is likely to start with the DOL considering whether to force the groups to provide certain financial disclosures. It could also include rethinking whether some of their protest activities run afoul of federal labor law. “One can make a fairly safe assumption that this Labor Department is going to take a closer look at these worker centers,” Glenn Spencer, vice president of the U.S. Chamber of Commerce’s workforce freedom initiative, told Bloomberg BNA. The chamber and other business groups have tried to paint worker centers as thinly veiled big labor pawns, designed to give unions a foothold in food service, retail and other largely nonunionized industries. Both sides agree that worker centers are filling a void created by the steady decline in union membership, including by advocating for higher minimum wages, shining a light on alleged worker abuses, and giving employees more voice on the job. Some of the groups have also gained political clout, boosted by the White House run of Sen. Bernie Sanders (I-Vt.) and successful wage campaigns at the state and local levels. Worker centers more recently have relished their role as a vocal thorn in the side of Puzder, who Feb. 15 withdrew his name from consideration for the DOL post. They headed a relentless protest and publicity campaign against the CKE Restaurants Inc. chief, highlighting what advocates say is rampant wage theft and discrimination at the company’s Hardee’s and Carl’s Jr. franchise operations. “The idea that he would be secretary of labor responsible for enforcing the same laws he’s been breaking is unfathomable,” Kendall Fells, Fight for $15’s organizing director, told Bloomberg BNA. The group recently held rallies and protests at Hardee’s and Carl’s Jr restaurants in 24 cities, as well as an event outside of CKE offices in St. Louis. Worker centers like those advocating for black and immigrant laborers have been operating in cities across the country for decades. Their role has grown in recent years, however, as traditional union membership continues on a downswing. Unionization in the private sector has plummeted from the early 1980s, when nearly a quarter of workers were covered by a collective bargaining agreement. About 6 percent of workers were represented by unions last year, a new low. ROC United meanwhile saw its revenue more than double in one year alone, jumping to over $7 million in 2014. That’s still a drop in the bucket compared with the hundreds of millions of dollars that big unions like the AFL-CIO and Service Employees International Union bring in each year. Employers and management groups say unions’ message simply doesn’t resonate with today’s workforce, in which employees often do more specialized tasks and are covered by a myriad of federal, state and local protections. Labor advocates, on the other hand, argue that state right-to-work laws and other regulatory changes make it harder for them to organize workers, despite data showing that union-represented employees generally make more money and get better benefits than their nonunionized counterparts. “These groups will continue to grow in popularity in an era where collective bargaining remains under severe attack and worse,” Larry Cohen, the former president of the Communications Workers of America, told Bloomberg BNA. Cohen, who was a policy adviser for Sanders’ campaign, said Fight for $15 and other groups were a “key element” in helping the candidate go further in the Democratic primary than many expected. Fight for $15 also scored big victories last year, as California and New York enacted legislation to gradually increase the minimum wage for most workers to $15 an hour. The group has been credited with pushing McDonald’s to increase pay for workers at company-owned restaurants and getting University of Pittsburgh Medical Center to commit to a $15 minimum wage. ROC United, meanwhile, has pushed to eliminate the lower tipped minimum wage for restaurant workers and often stages protests to draw attention to alleged discrimination and worker mistreatment by specific employers. It also provides legal support to workers pursuing wage, hour, discrimination and other claims against their bosses. Puzder’s withdrawal from consideration to be labor secretary may just be the groups’ most unexpected win to date. They focused on Labor Department data showing some wage and hour violations at CKE franchise-owned restaurants and Puzder’s previous statements opposing a move to expand overtime pay and criticizing steep minimum wage hikes. The groups also highlighted the recent revelation that Puzder didn’t initially pay taxes for an undocumented immigrant he employed as a housekeeper. ROC United co-founder Saru Jayaraman and Sian Lewis, a political and legislative consultant for the group, didn’t respond to Bloomberg BNA’s request for an interview for this story. ROC United on its website calls Puzder “an avowed enemy of restaurant industry reforms,” who will block efforts to raise minimum wages and protect workers. The International Franchise Association, an industry group from whose board Puzder resigned in January, has made no bones about its position on the advocacy organizations. “If it looks like a union and acts like a union and harasses like a union, it should be treated like a union,” IFA Senior Vice President Matt Haller told Bloomberg BNA. Worker center critics have been aiming most of their fire at trying to get the DOL to force the groups to file the same financial disclosures required of unions. That includes annual LM-2 reports, which track dues and fees collected, detail where unions spend and receive their cash, and provide information about loans and investments. The disclosures would be “useful to try and refute this concept that these union front organizations are amorphous swarms of workers coming together because they’re fed up with abuse from their employers,” the chamber’s Spencer told Bloomberg BNA. He added that dues-paying union members may also want to know how much money is going to worker center activities designed largely to help nonunion workers. Fight for $15 is affiliated with the Service Employees International Union, and Labor Department disclosures show that the union pays Fells’ and the group’s other salaries. Fells told Bloomberg BNA Fight for $15 “is its own organization,” however, which operates separately from the union. 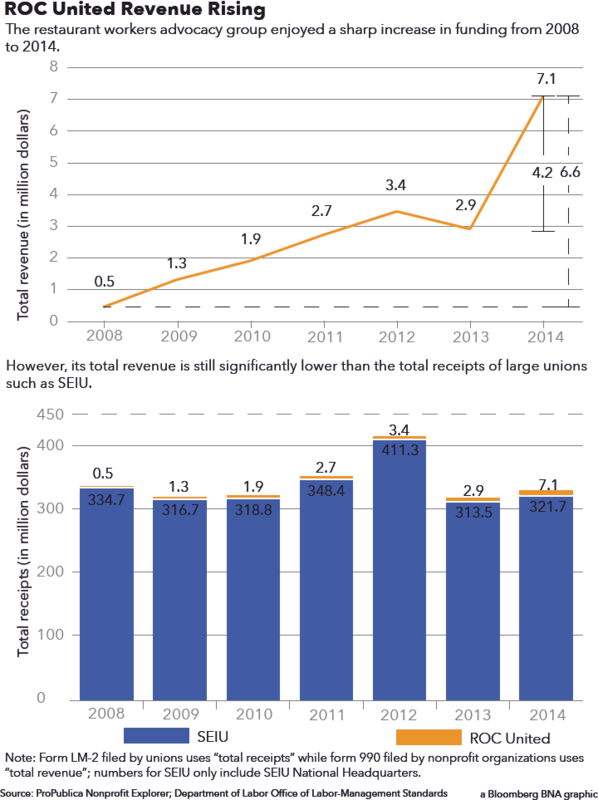 The disclosures don’t show how much money the SEIU spends on Fight for $15 activities each year. Similar filings by the United Food and Commercial Workers also leave the details about how the union funds a campaign called Making Change at Walmart, an advocacy effort that a union spokeswoman said shouldn’t be considered a worker center. 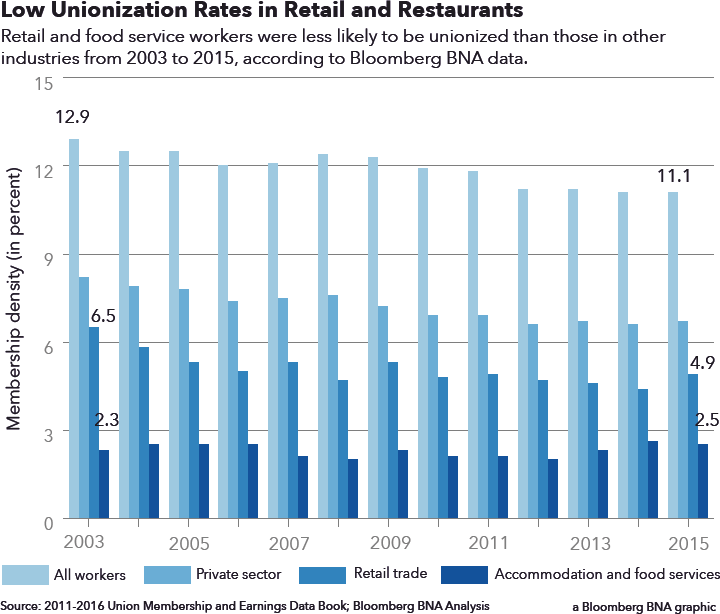 Retail and food service are largely nonunionized industries, thanks in part to efforts by Wal-Mart, McDonald’s and other large employers. ROC United, which isn’t directly affiliated with a union, says it doesn’t file the disclosures because it’s not a “labor organization” under the Labor-Management Reporting and Disclosure Act. Like OUR Walmart, which operated as a UFCW subsidiary until 2015, the group says its doesn’t seek to negotiate with employers about terms and conditions of employment. The Labor Department during the George W. Bush administration twice backed up ROC’s position, finding the group didn’t qualify as a labor organization under the law. Still, critics are hoping the DOL may give that decision another look. “There’s an opportunity to fully peel back the onion on their activities,” IFA’s Haller said. Picketing Law a Bridge Too Far? Some worker center critics would like to see Uncle Sam go a step beyond financial reporting requirements. Employers and their lawyers have also argued that some worker center protests might run counter to the National Labor Relations Act. A Fight for $15 protest at first glance looks a lot like what you might expect to find at a picket line of striking union employees, with protesters waving signs and chanting outside of an employer’s place of business. The group has participated in worker strikes at fast-food restaurants and airports across the country in which workers called for higher wages and union representation. Still, labor lawyers on both sides of the aisle told Bloomberg BNA it’s a long shot that the groups could be covered by the NLRA’s limits on work stoppages and secondary boycotts targeting people or companies that do business with a certain employer. That’s because the worker centers usually aren’t asking to be recognized for collective bargaining purposes or otherwise considered to be “dealing with” an employer about terms and conditions of employment for purposes of the law. “I think it comes back to whether their activities show a pattern or practice of dealing with the employer over time,” John Raudabaugh, who served as a Republican National Labor Relations Board member during the George H.W. Bush administration, told Bloomberg BNA. Even Wal-Mart-specific groups that want the retailer to change sick leave and other policies aren’t likely to fall under the labor organization umbrella, Raudabaugh and Chairman William B. Gould (D) said. The NLRB general counsel’s office in 2006 issued an advice memo finding that Restaurant Opportunities Center of New York wasn’t a labor organization under the NLRA. The memo focused on ROC NY’s efforts to settle workers’ discrimination lawsuits against restaurants. NLRB Associate General Counsel Barry Kearney, who still works in the Division of Advice, said in the memo that the group’s “isolated” attempts to settle the claims didn’t qualify as a pattern or practice of dealing with the employers over time. Kearney also cautioned, however, that the conclusion was highly specific to the situation. He said the board and courts take an “expansive view” of what qualifies as dealing with an employer under the law. That’s a view that Spencer, Marculewicz and others would like to see revisited. But Raudabaugh said employers may want to be careful what they wish for. A worker center that is considered a labor organization would likely get the broad rights to seek recognition through a representation election and to bargain on behalf of all workers in a covered unit. “It would lead these groups to organize in a more formal way,” Raudabaugh said. Fells declined to speculate whether the Trump administration may look to turn up the heat on Fight for $15. “We’re always up for a fight,” Fells said.